A high-frequency (1 MHz) ultrasonic device was applied to investigate the relationships between the somatic cell count (SCC) in milk and the physical properties measured through the changes in the velocity and attenuation of wave propagation during gelation formation in the California mastitis test (CMT). Owing to nonhomogenous mixing without shear applied in CMT gelation, ultrasonic signals were more unstable than those under a complete mixing condition. On the basis of the complete mixing condition, the velocity had no significant relationship with SCC concentration; however, there was a clearly positive relationship between attenuation and SCC concentration. 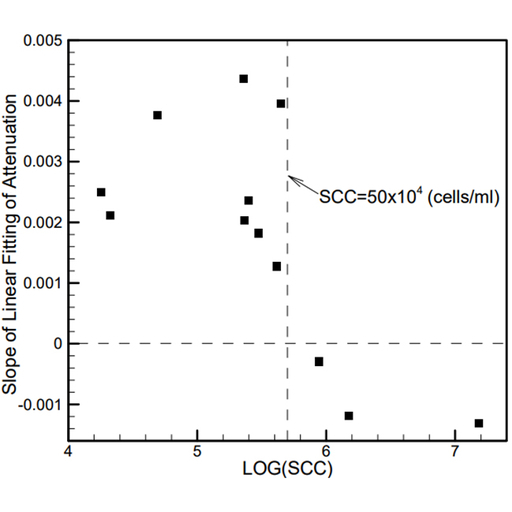 In addition, the linear fitting slopes of attenuation during the measurement were positive as the SCC concentration was less than the threshold value (SCC = 5 × 104 cells/ml). In contrast, the slopes became negative. Chien-Hsing Chen and Li-De Zhang , Evaluation of Milk Quality by Ultrasonic Technique, Sens. Mater., Vol. 31, No. 2, 2019, p. 279-285.